Who can forget Chiyaan Vikram's role in Anniyan in which he played a character suffering from multiple personality disorder? The psychological thriller, which was the brainchild of maverick filmmaker Shankar, was critically acclaimed and its Tollywood version Aparichithudu cre ated a new market for Chiyaan's films in Andhra. According to confirmed trade sources, the super hit combo of Shankar and Vikram are coming together for a new movie that will go on floors some time in September. Sources say that Shankar, who is happy with the tremen dous response his recent flick Nanban has garnered, will start working on the new project after taking a small break. 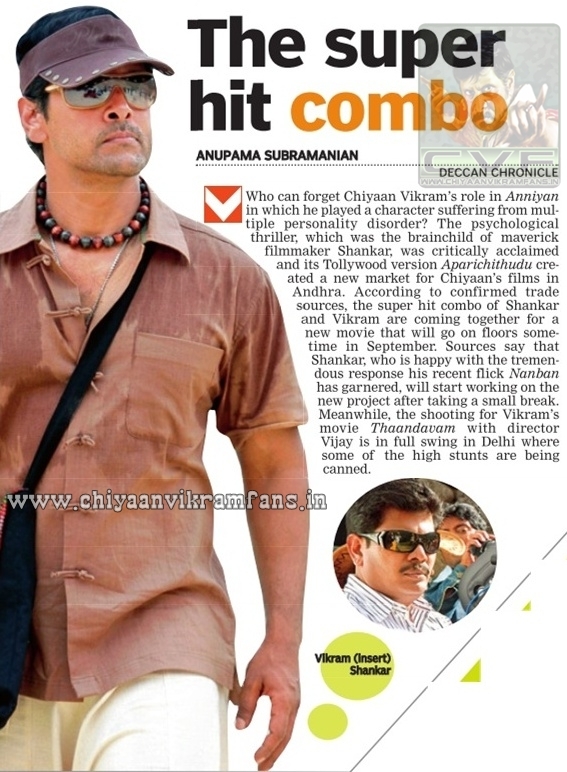 Meanwhile, the shooting for Vikram's movie Thaandavam with director Vijay is in full swing in Delhi where some of the high stunts are being canned.